It’s total CO2 that matters—not just CO2-per-barrel alone. 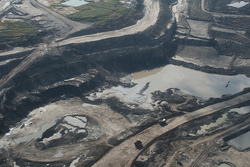 The tar sands may be only 15–40% worse per barrel than regular oil, but regular oil is already a major problem. The “dirtiness” of the tar sands comes from the total area of the bar (total GHGs), not just from the vertical axis alone (GHGs-per-barrel). Carbon capture and sequestration (CCS) can only deal with extraction emissions (well-to-tank, above the horizontal line) and not the emissions when the oil is burned in a car (tank-to-wheel). CCS can therefore only bring tar sands emissions down to the same level as conventional oil, leaving a massive amount of emissions unaddressed. We have to draw the line somewhere if we’re going to stop climate change. If all emissions shown occur, we face dire consequences. From a carbon perspective, the wisest approach is to exploit the resources that have the lowest emissions and lowest price while we make the transition to a low-carbon economy. The threshold that determines where the line is drawn would ideally be set based on the maximum amount of emissions and temperature rise that we can tolerate. According to Joe Romm’s analysis, for a 2°C temperature rise, the line needs be drawn at conventional oil: enhanced oil recovery, tar sands, synfuels and oil shale would all be out. The Canadian perspective is not the global, rational perspective. The above analysis was the 10,000-foot perspective on the issue. If adopted, if would mean that Canada would have to forego the valuable tar sands and allowing others (particularly in the Middle East) to take massive profits from selling conventional oil—which is, as already noted, a dirty and dangerous resource. There is undoubtedly an element of unequal treatment involved, although it clearly makes sense in terms of optimizing the energy/emissions ratio. The regulatory tool that is currently being mooted to address this issue is carbon fuel content regulation. California’s ambitious Low Carbon Fuel Standard (LCFS) aims to progressively reduce the lifecycle carbon emissions emitted for each barrel of fuel burned, with an initial target of a 10% reduction in sales-weighted fuel carbon intensity by 2020. This avoids the rancorous process of picking winners and explicitly declaring the tar sands off-limits—instead, it simply requires that any sales of high-carbon fuels be balanced by low-carbon fuels (such as yet-to-be-commercialized cellulosic biofuels). If it works, it would effectively impose a disincentive on the use of high-carbon fuels, without explicitly banning them. The Alberta government is pursuing CCS for the tar sands (with lackluster enthusiasm from the oil companies themselves). Given the Alberta government’s tepid and ineffective climate policies, many argue that this is simply a distraction or greenwashing. However, it could possibly be interpreted as a strategy to level the playing field for the tar sands relative to conventional oil. If many governments worldwide adopt some LCFS-like regulation to tackle climate change, regular tar sands oil will be more challenging to sell because it will have to be balanced by a large amount of low-carbon fuel sales. 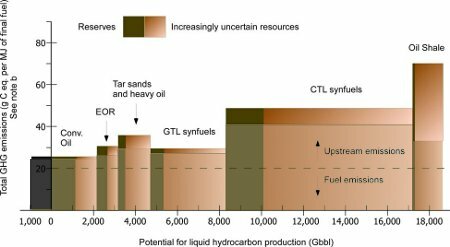 However, if CCS is implemented for the tar sands, then tar sands production would be GHG-equivalent to conventional oil, and equally attractive on the global market—except for the price of its inputs (natural gas) and the CCS costs. To be effective, sequestration would need to be 100% reliable with no leakages of carbon dioxide. Even a small annual leakage rate from a sequestration site could unravel the sequestration effort, with enough time. It will also need to be auditable and verifiable. The most cost-effective place to deploy CCS will be in coal plants. Using it for natural gas would likely be a waste of capital, since natural gas is already one of the cleanest-burning fuels. In a future with real constraints on carbon, the opportunity cost of using scarce clean natural gas to extract oil (instead of using it to replace coal plants) would also make tar sands CCS a poor choice. Suppose that we cannot allow the total emissions from oil to exceed the area of the “conventional oil” box in the graph above. Even if each barrel of CCS-equipped tar sands is GHG-equivalent to conventional oil, this doesn’t change the total emissions allowed—for each barrel of tar sands oil extracted, a barrel of (much cheaper) conventional oil would have to be left in the ground. Ultimately, this is why authors like Joe Romm are so scathing about the tar sands. North of the 49th, we have trouble seeing anything beyond our economy’s dependence on the tar sands and associated jobs and windfall of wealth. At some point we’re going to find that we still need petroleum but have gotten past peak oil without enough green infrastructure to take over completely. Then those tar sans will look pretty attractive. What might make extraction a better choice is to site power plants nearby and use the waste heat from nat gas or nuclear to provide the energy to get the oil from the sands. Um… no. Yes, we will absolutely hit the peak of conventional oil and find that the tar / oil sands look attractive. But the point of my post here is that even if you could eliminate the carbon during the extraction of the oil, the carbon from the burning of the oil will cause vast damage. The cumulative effect of using both the remaining conventional oil plus a substantial fraction of the remaining unconventional oil (like the tar sands) adds up to too much carbon—we likely need to cut off use of all oil before we get that far. Taking this analysis in isolation, it sounds like the problem is the burning of oil at locations far away from convenient CCS. One natural conclusion is to gasify tar sands on-site into energy-containing molecules with more energy per carbon atom: syngas and hydrogen. If this gasification and reforming were done on site, carbon capture could be performed on both the CO2 emitted by the tar sand refining process, and the CO2 emitted in the hydrogen reforming process. The mobile emissions sources would have zero emissions (hydrogen) or high energy per carbon atom (natural gas). Alternatively, stick your power plant on top of the tar sands refinery, and capture the CO2 coming out of the power plant as well. Export electricity to battery powered vehicles. I’m not convinced the electrified / hydrogenized path will actually happen though … there are other barriers to that future. My money’s still on efficiency, plug-in hybrid electric vehicles, transit/walk/bike, and possibly all-electric-vehicles as the sensible ways forward. What a lot of people don’t realize is that the process of gasification into syngas followed by Fischer Tropsche synthesis into marketable synthetic crude works on anything that burns, not just tar sands. If you fed the gasifiers trash and dried sewage and sequestered the charcoal byproduct as biochar then the process would be carbon negative.